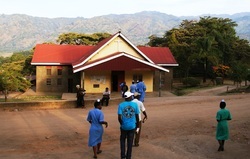 Kagando Rural Development Center (KARUDEC) has been serving people in the Kasese District of Uganda since 1965. The enterprise has steadily expanded so that it now encompasses a 250-bed hospital, a Nursing School with close to 200 students, a primary school with over 700 students, a Mother Care Home, a micro-finance bank and various other small businesses. KARUDEC is the staging area for significant development projects in the Kasese District; projects aimed at improving health, promoting agriculture, and providing clean water and sanitation. For more information about KARUDEC, please visit: www.kagando.org. Since 1986, electricity generated by a micro-hydro system on the Rwembya River, which flows alongside the KARUDEC property, has powered the KARUDEC compound, with a diesel generator supplying back-up power. As of August 2010 the hydo system ceased functioning, creating a severe hardship throughout the KARUDEC compound. AHEAD is working with the Center for Research in Energy and Energy Conservation at Makerere University to develop a plan to rehabilitate the hydro system and secure the funding to do so. With funding from the Dorothea Haus Ross Foundation, AHEAD has built efficient institutional Rocket Stoves at Kagando Primary School and domestic stoves at the New Mothers Care Home. AHEAD partnered with the East African Energy Technology Network to build the stoves which have 200 liter water tanks embedded in the stove chimneys so that water can be heated as food is cooking. With funding from the Women of the Evangelical Lutheran Church in America, AHEAD has built 42 clay-brick domestic-size stoves in a kitchen at Kagando Hospital. This project included partnering with the International Lifeline Fund to train two dozen local residents to build the stoves, thus spreading the technology and sparking local entrepreneurship. AHEAD is gearing up to convert KARUDEC’s animal waste streams into two highly usable products: methane gas for cooking and a natural fertilizer for gardening. This will be achieved using anaerobic digestion in a commercial scale biodigester. KARUDEC is an optimal locale for this project because it has several institutional kitchens where biogas can replace the damaging use of firewood. There are also cows, pigs, goats and chickens on the property, and KARUDEC operates agricultural projects that can utilize the fertilizer. AHEAD is partnering with Green Heat Uganda on this project.